Black Milk fans call themselves Sharkies (for their predatory love of the brand, in case you’re wondering). Sharkies across the globe support more than 60 private Facebook communities, among dozens of other social channels. Why so many? Early on, women of different shapes and sizes began posting photos of themselves on Instagram wearing their Black Milk tights. Photos of real-life women wearing Black Milk tights offered inspiration to those concerned about fit. They also provided social proof that their fashion sense was right on the money. To drive more Sharkie selfies, the brand created unique hashtags for each product. And Sharkies themselves started a trend to include clothing size in hashtags. The result: an always-on runway for women to see form-fitting clothing looking fantastic on any woman, not only waifish models. Hesitant buyers are encouraged to buy not only for the online camaraderie, but with full knowledge of what a product looks like on real women of their own size. Website and promotional video content features a variety of women replete with tattoos, piercings and all manner of hair and make-up. Customers are more than fans, they’re Black Milk models — and part of the Black Milk story. As Parker points out, it’s not just authenticity in images working in Black Milk’s favor; letting fans guide product development is also key. Sharkies are instrumental in setting themes — like Game of Thrones, Harry Potter, and Star Wars — for product lines. This results in highly anticipated collections that become collector’s items with enviable regularity. “Girls love talking to our designers. We probably do too much listening… They’re quite demanding,” jokes Parker. Parker and Black Milk Founder James Lillis travel the world to attend Sharkie meet-ups — whether it’s at a Las Vegas conference or a park bench in Perth, Western Australia. Being accessible to the customer base and fostering the intense, almost rabid loyalty of Sharkies is a cornerstone of Black Milk’s marketing strategy. Of course, all that loyalty and cliquishness can be a double-edged sword, as Black Milk discovered painfully on “Star Wars Day” in May 2014. Black Milk posted a message on Facebook in what it thought was self-effacing Australian humor. Essentially, Black Milk compared a vampish female dressed in Black Milk Star Wars tights, with the image of Mayim Bialik’s character on the TV show, The Big Bang Theory. The comparison —meant to juxtapose hot vs. nerdy — was seen as offensive by many Sharkies who thought it contrary to the non-judgmental values Black Milk said it stood for. The brand compounded the problem by deleting posts and comments rather than ‘fessing up to the misstep immediately. Parker did eventually issue an apology… but not before Black Milk got a quick lesson on what can happen when a brand pulls fans so close and then disappoints them. An internal review of social media policies and procedures was immediately conducted. Intensified training focused on role-playing was implemented for what is arguably one of the best social media teams in Australia. Parker admits he doesn’t have all the answers but, then again, trailblazers often don’t. If you want to sell high-quality clothing manufactured in pricey Australia and still turn a profit, it’s not going to be easy. Despite a $70 USD price tag for a standard pair of tights, Black Milk is selling more than 1,000 garments a day across the globe. In every step of the sales process, a story unfolds. Parker equates customer engagement with an onion, ensuring every layer has its own story. Indeed, the sales receipt is nearly 600 words and a gift voucher begins, “Once upon a time…” Shoppers are compelled to read every word because it’s so unexpected, yet it’s still everything Sharkies want — a chance to be part of a bigger story. Brand storytelling, accessibility, and authenticity are an important part of the future of fashion; but technology is also playing a part. Mashops bring together the virtual and physical worlds in the store, and these are some of the coolest content marketing tools on the scene. • Tensator Virtual Assistant is a digital sign using a big whack of artificial intelligence to give shoppers the illusion of speaking to a shop assistant. She’s friendly, welcoming, and incredibly helpful, she speaks multiple languages, and she’s available 24 hours a day. • CognoVision from Intel is facial recognition software creating heat maps of traffic flow in a physical store. This allows retailers to get a better idea about what shoppers do and what attracts them to certain displays and products. • BodyMetrics is a full-body scanner similar to the kind found in airports. It predicts and recommends the ideal product for a customer’s body type and size from hundreds of different brand-name clothes, allowing them to shop in-store or at home. 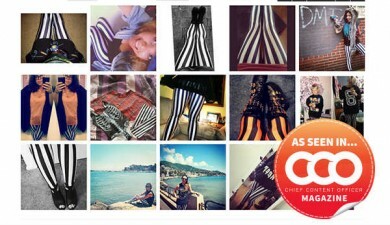 • Fashion Like is a Brazilian product marrying social networks with physical clothes hangers. A digital screen in the clothes hanger reflects the number of “likes” it has received on Facebook, giving shoppers a strong social signal about the popularity of specific items of clothing. • Cisco StyleMe is a life-sized mirror that lets shoppers try things on without changing clothes or needing a changing room. Shoppers also benefit from expert fashion advice and the ability to hook into their social channels. Historically, the retail industry operated on a two-shelf system — one in the store where retailers show their product and another in the shopper’s home where purchases are displayed. The introduction of a “third shelf” has disrupted the traditional path to purchase. Doug Stephens, aka the Retail Prophet, describes the third shelf as a place that is not the store nor the customer’s home, but a wonderfully appropriate location for consumers to shop. It might be an online store, a digital app, or even the packaging of the product itself. More and more it’s found in collaborations between brands and influencers. And in the future it may be something entirely different. Even traditional retailers are finding relevance on the third shelf. Australian retailer Sportsgirl opened its doors in 1948 and has long been a stalwart of malls and downtown shopping. Recognizing a third-shelf opportunity, it launched an integrated content strategy in March that melds digital and print content with a big whack of user-generated content to ensure customers are thinking about fashion #twentyfiveseven. Digital store windows are running three movies on the Style Never Sleeps theme, while a new print magazine, The Daily Us, is being handed out inside. The retailer’s ecommerce smartphone app has been updated so readers can retrieve additional content, like beauty tutorials and catwalk shows, using augmented reality with the print magazine. Armed with so much fashion goodness, young fashion mavens photograph their Sportsgirl look and upload it to social networking communities, ensuring the Sportsgirl cash registers are running 24/7, too. The concept of the third shelf means shoppers are no longer content to be a passive part of the fashion equation. Successful fashion houses realize the importance of being accessible and including shoppers in their brand story. The third shelf means the store is everywhere and nowhere. It also means retailers must find a way to become relevant to their customers at a time when they’re ready to purchase. It’s a big ask, for sure, but Black Milk and Sportsgirl prove it’s possible, whether you’re a young upstart or an established brand. Sarah Mitchell is the founder of Typeset, a specialist editorial services, content marketing and journalism company with offices in Perth, Western Australia and London, United Kingdom. She's also the founder of Global Copywriting. Sarah frequently speaks on topics related to Content Marketing and writing. She's the Australian editor for Chief Content Officer magazine. Follow her on Twitter: @SarahMitchellOz.